The Technology Sector in India is booming, and in this boom, there are a number of companies taking advantage of the new technologies and improving the service being provided to their clients. The advancements in the Technology Sector has penetrated almost every other sector in the Indian economy, one of the main sectors taking advantage of the progress is the Finance sector. The Financial Technology (fintech) market in India is expected to grow at a Compounded Annual Growth Rate (CAGR) of 22% in the next five years according to NASSCOM. KPMG estimates that the transaction value of the Indian fintech sector, which is presently at $33 billion, will grow to approximately $73 billion by 2020. With an increasing number of fintech companies joining the fray, there are all sorts of products being offered in the market. Since the Securities and Exchange Board of India (SEBI) made it mandatory for all mutual fund houses to offer Direct Plans to their investors, one of the top products in the Indian financial markets are Direct Investments. The fintech industry has developed a number of platforms for various services, from banking to stock trading to investments and now, Direct Mutual Fund plans. 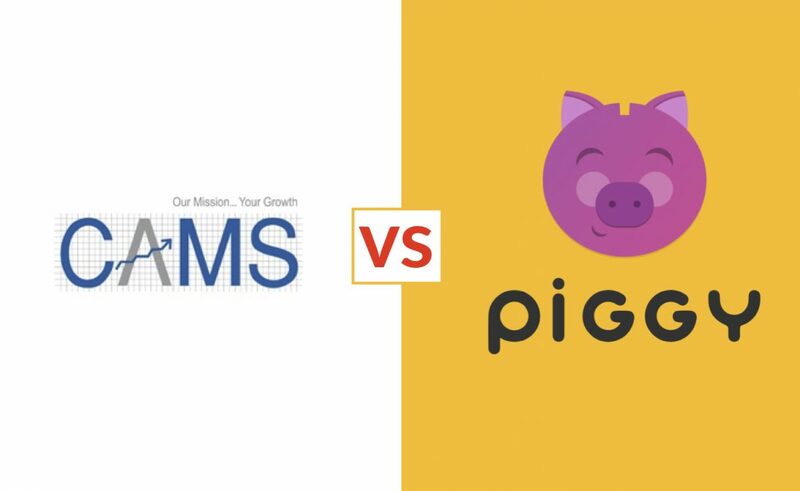 Two such investment apps that really stand out among the crowd are Piggy and myCAMS, with their unique use to the technology they have managed to bring users some of the best financial services. We have listed the features of these platforms below. CAMS is currently the leading Transfer Agency to the Asset Management Industry in the India. The company has recently diversified as a technology solutions provider for Private Equity Funds, Private Life Insurance, and Non-Banking Financial Companies. The company serves as a B2B business solutions partner as well as a B2C solutions partner at many touch points. One of them being the myCAMs App. myCAMS is an initiative by Computer Age Management Systems (CAMS) to develop a Mutual Fund investment platform that is easy and fast to use. The myCAMS app allows users to create a single login ID on the CAMS website and use it to transact across all Mutual Funds facilitated by CAMS. The app supports online transactions, monitoring of investment, online statements, downloading services request forms etc. Piggy was started with the idea that a technology-driven, user-focused platform can solve most problems associated with an investment. Piggy allows users to Login with a single ID to make transactions across a very wide variety of Mutual Funds. The app is easy to use and fast. The Piggy dashboard allows users to monitor their investments and track the progress of their requests. The company leverages technology to keep its costs low to provide you with free service so that you can grow your money exponentially. myCAMS comes with many features to make investment easy for its users. myCAMS brings you a host of features that will help you not only to stay updated on your Mutual Fund investments across all funds serviced by CAMS, but also transact with ease. Now, investing in a new folio across participating Mutual Funds, switching between schemes, viewing portfolio, setting up a Systematic Investment Plan (SIP), opting for a Common One Time Mandate (OTM), sending a query – myCAMS allows you to do multiple tasks through a single, secure gateway anytime anywhere. Piggy comes with a plethora of features to help you invest smarter and save you time and money while doing so. Piggy has features that are not only geared towards Mutual Fund investments but can also help you save taxes and track your EPF. The app allows users to easily transact between a large variety of Mutual Funds. The app also allows its users to convert their existing Mutual Funds from Regular Plans to Direct Plans via the Smart Switch. The Smart Switch times the conversion from Regular to Direct in order to save you tax, exit loads and other fees. Direct Plans are offered by the Mutual Fund Houses to investors and do not have any intermediaries. Due to the absence of an intermediary, the expense ratio of the fund comes down, which gives the investor an additional 1% on their returns. Users can also invest through Systematic Investment Plans (SIPs) and Flexi SIPs to get the most out of their investments. A SIP allows investors to make regular investments in Mutual Funds by regularly deducting a predetermined amount from the investor’s bank account towards the desired Mutual Funds. A Flexi SIP allows an investor to vary the SIP amount every month, this gives the investor the financial flexibility to dynamically invest according to their income and expenses. The ergonomically designed Dashboard allows users to easily monitor their investments and is designed to make the process of investment easy and more rewarding. myCAMS offers mutual funds from 15 mutual fund houses. Piggy offers mutual funds from 33 mutual fund houses.